Autogas - also called Automotive LP Gas - is the most widely used alternative fuel for road transport, powering more than 27 million vehicles worldwide. In addition to its economic and safety benefits, Autogas has lower emissions than almost all other automotive fuels, contributing significantly to cleaner air. Autogas (LP Gas, or propane used as an automotive fuel) is an outstanding fuel for vehicles that must comply with increasingly stringent emission requirements. Low emissions of particulates (PM), carbon monoxide (CO), nitrogen oxides (NOx) and hydrocarbons (HC) enable autogas to outscore conventional fuels and most other alternative fuels for environmental benefits. It also plays an important role in mitigating climate change because it has among the lowest life-cycle greenhouse gas emissions of all commercially available fuels. Moreover, autogas is a non-toxic and non-poisonous fuel that will not contaminate aquifers or soil if spilled. Autogas is a clean transportation fuel with impressive environmental benefits that are driving fuel choice decisions worldwide. Autogas offers an immediate, concrete solution to improve air quality especially in urban areas.In terms of air-borne emissions of the principal regulated noxious gases, autogas is among the lowest of all automotive fuels available today. According to authoritative scientific testing, autogas yields 50% less carbon monoxide, 40% less hydrocarbons, 35% less nitrogen oxides, and 50% less ozone forming potential compared to gasoline. The health benefits from such lower emissions are significant. Autogas can play an important role in mitigating climate change. It has among the lowest greenhouse gas emissions of all commercially available fuels, when measured over its full life cycle. For example, autogas can produce on average 20% less CO2 equivalent compared to gasoline when total emissions from well to wheel are taken into consideration. The environmental advantages of autogas over conventional and other alternative fuels are even greater with respect to unregulated emissions, including air toxics. Compared to gasoline and diesel, autogas has lower VOC (volatile organic compounds), formaldehyde, acetaldehyde, butadiene, and benzene emissions. The analysis also shows that autogas therefore has the lowest impact on potential cancer risk. Autogas vehicles will maintain their environmental advantages compared to other conventional automotive fuels, especially regarding the current unregulated pollutants. Autogas will also benefit from new automotive technologies that optimise fuel combustion, such as direct injected gasoline and diesel vehicles. Autogas features far lower NOx and PM emissions compared with diesel vehicles, even those equipped with the most advanced technologies such as particulate traps or special diesel particulate filters. Congestion driving dynamics tend to increase emissions of CO, HC, PM and fuel consumption, mainly due to engine load changes or high engine loads. During these periods, catalysts do not perform at the optimal level - but these increases are far lower for autogas vehicles than for gasoline. Diesel cars show a significant increase of PM at high loads. Another positive characteristic of an autogas engine is the reduced emissions at cold engine start. (Note: Cold start emissions represent a significant percentage of a vehicle's total emissions. When an engine and the associated exhaust catalysts are cold, they do not perform effectively, enabling emissions to escape through the tailpipe). This phenomenon is particularly important for urban fleet vehicles operating on short trips. Autogas is an intrinsically clean fuel.It will demonstrate clean emissions over the lifetime of the vehicle, regardless of the owner or the existence and maintenance of exhaust gas after-treatment technologies (necessary for gasoline and diesel vehicles to achieve similar emissions performance). This was confirmed in a US Environmental Protection Agency study that demonstrated that OEM autogas vehicles show very little deterioration of emission performance during a vehicle's useful life (up to 120,000 miles). Finally, an added environmental benefit is that in the event of fuel spill, autogas quickly evaporates into the air. 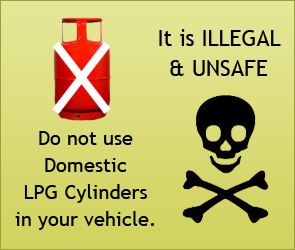 Therefore, in contrast to gasoline and diesel, there is never a risk of ground or water contamination. Moreover, autogas vehicles are significantly less noisy than diesel-powered light and heavy duty vehicles. 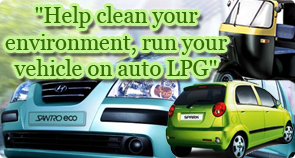 Autogas is an outstanding fuel for vehicles that must comply with increasingly stringent emission requirements. It offers an immediate, practical solution to improve air quality, especially in urban areas and can play an important role in mitigating climate change. There are compelling environmental, operational, and economic reasons for including autogas in any strategy aimed at promoting alternative fuels for road transport.